It seems like everyone is playing Angry Birds these days, including some of the folks right here at The Flickcast. In truth, the Star Wars variation is our favorite. . . naturally. But Angry Birds maker Rovio isn’t resting on its laurels and is busy developing many more games for the exploding mobile gaming market. 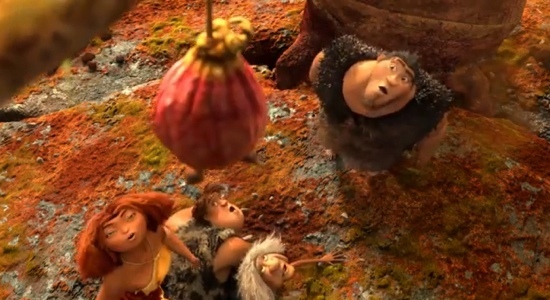 One of the next ones coming from them, in conjunction with Dreamworks Animation, is called The Croods. Say what you will about the Angry Birds franchise of games and its relative merits, it looks like it’s here to stay. How do we know? Well, the company that produces the series of games, Rovio, announced on Monday that the company’s latest Angry Birds installment, Angry Birds Space, has been downloaded 50 Million times in just 35 days, making it the fastest growing mobile game of all time. In the same announcement the company also hinted that “something even bigger is on its way.” What that is, we can’t imagine. The Pigs strike back perhaps? We’ll see. If you haven’t had a chance to play Angry Birds Space yet, you should. It was released on March 22 for iOS, Android, Mac OS X and Windows so you should have no trouble finding a platform to enjoy it on. Besides, it’s quite fun to play. In fact, we would go so far to say it’s probably the most fun of the Angry Birds franchise since the original. For more on the game, check out the video after the break. You may not be aware of it but a series of games from Rovio about a bunch of birds angry enough at some pigs to fly over them and drop bombs shaped like eggs is doing pretty well. So well, in fact, that the original Angry Birds and its subsequent versions have sold millions of copies. In fact, there’s even making a movie about the birds. This week the company updated its latest incarnation, Angry Birds Space, for the Android OS. With this update comes a new ice planet containing ten brand new levels. What more could you want for a Wednesday morning? I don’t know about you but I find this game a great way to kill some time waiting in line at the post office or at the DMV. Even though some may think its over-hyped, if it provides fun and a bit of distraction, it’s a success in my book. To get the update, or to get the game in the first place, head on over to the Google Play store and pick it up.